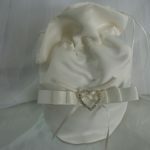 Ivory satin dilly bag with flat ivory satin bow and diamante heart brooch. Drawstring closure. Approximate dimensions 17cm tall x 11cm in diameter. 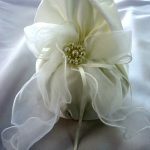 White satin dilly bag with organza bow and pearl cluster detail. Drawstring closure. Approximate dimensions 17cm tall x 11cm in diameter. 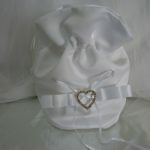 White satin dilly bag with flat white satin bow and diamante heart brooch. Drawstring closure. Approximate dimensions 17cm tall x 11cm in diameter. 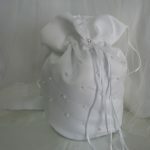 White satin dilly bag with quilting and white pearl detailing. Drawstring closure. Approximate dimensions 18cm tall x 12cm in diameter.